The adage “jack of all trades” could be adapted to “jack of all (non-dangerous) hunts” with this utilitarian, .308 Win. big-game load. 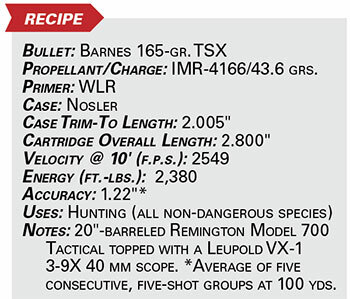 Containing Barnes Bullets’ 165-gr. Triple-Shock X Bullet (TSX), the fail-safe projectile will expand dependably while maintaining its weight for deep penetration in even the largest, toughest species, and the all-copper bullet can be used in leadless ammunition areas, too. Boosting said bullet to 2549 f.p.s. from a 20″ barrel—expect higher velocities from a longer tube—is the new temperature-insensitive and copper-fouling-reducing IMR-4166 propellant, which will keep your loads consistent and gun cleaner, respectively. Lastly, when zeroed at 200 yds., the TSX will impact 2.5″ high at 100 yds. and 10.1″ low at 300 yds.—an acceptable trajectory. Indeed, outside of the world’s dangerous species, this load will handle any big-game animal virtually anywhere with assuredness.